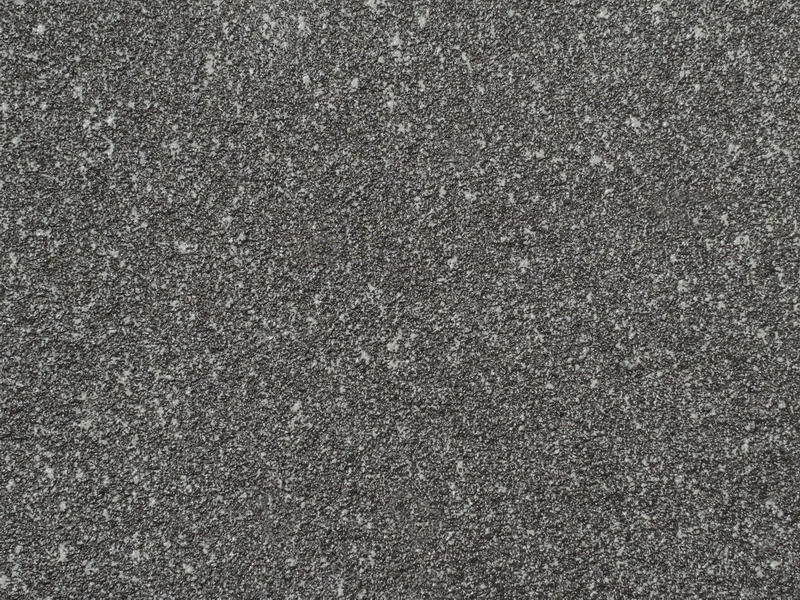 After a decade of research and field testing SEMCO released the brand new SEMCO ADA Safety Floor. 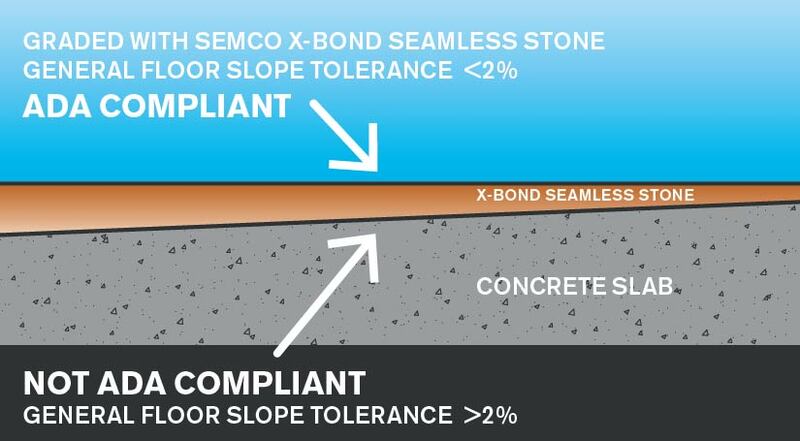 The SEMCO ADA Safety Floor is engineered to assist in remodeling projects that require ADA compliance in Dynamic Coefficient of Friction (slip resistance), Surface Slope Regrading, and Surface Aperture Closure. *Independent test results of the test performed on the SEMCO ADA Safety Floor are available upon request. Department of Justice ADA Title III Regulation 28 CFR Part 36, Section A4.5.1; Recommends minimum of 0.60 SCOF for horizontal surfaces and 0.80 SCOF on ramps. Slip resistant flooring is an important element of ensuring a public access floor is compliant with ADA regulations. 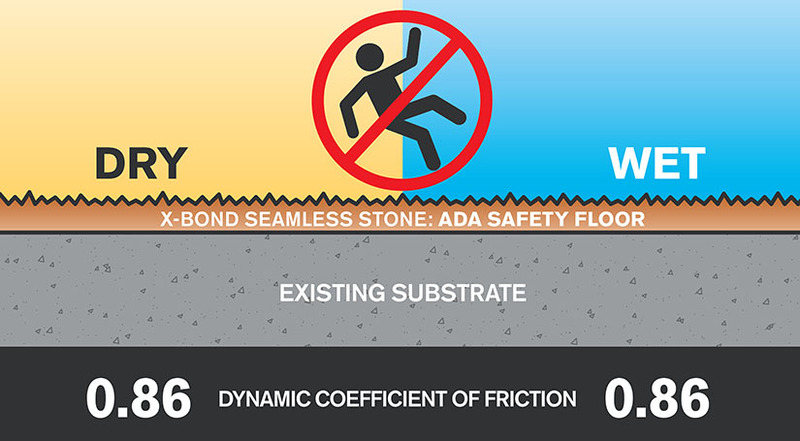 Currently a floor must have a minimum dynamic coefficient of friction (DCOF) between 0.30-0.42 for standard flat flooring, where sloped or ramped surfaces exceeding a 2% slope requires a DCOF between 0.30-0.45. Utilizing the SEMCO ADA Safety Floor with Remodel Without Removal™ ADA compliant flooring can be created on any solid flooring product. 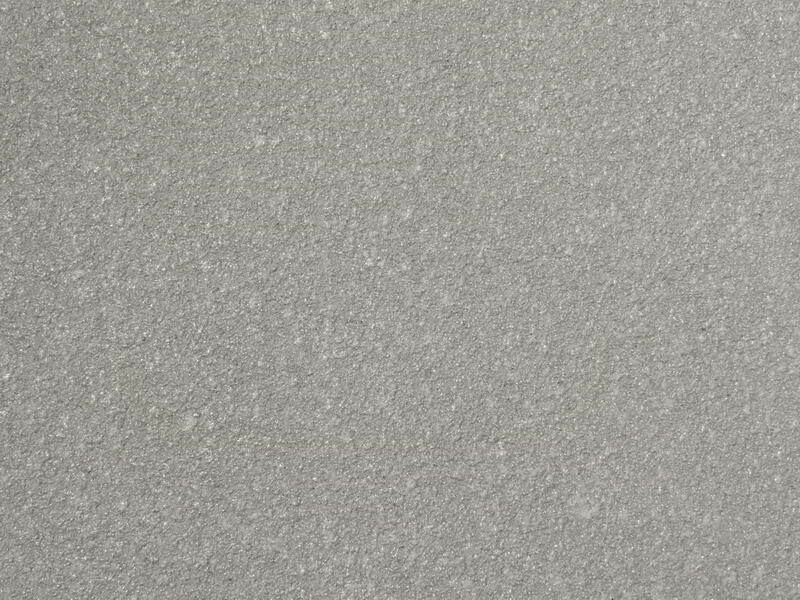 The SEMCO ADA Safety Floor provides a slip resistant floor that can be used for standard flooring or ramped surfaces. 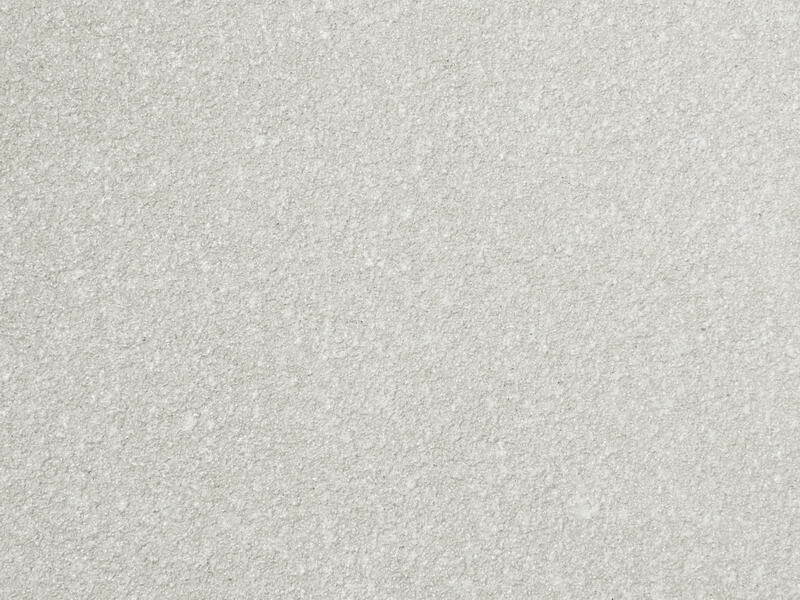 The SEMCO ADA Safety Floor maintains the same dry slip resistance when wet. To be in compliance with ADA regulations, a public access floor must not exceed a slope of 2%. A common area floor that has sloping exceeding 2% must be addressed as a ramp, which will require flooring DCOF rated between 0.30-0.45. 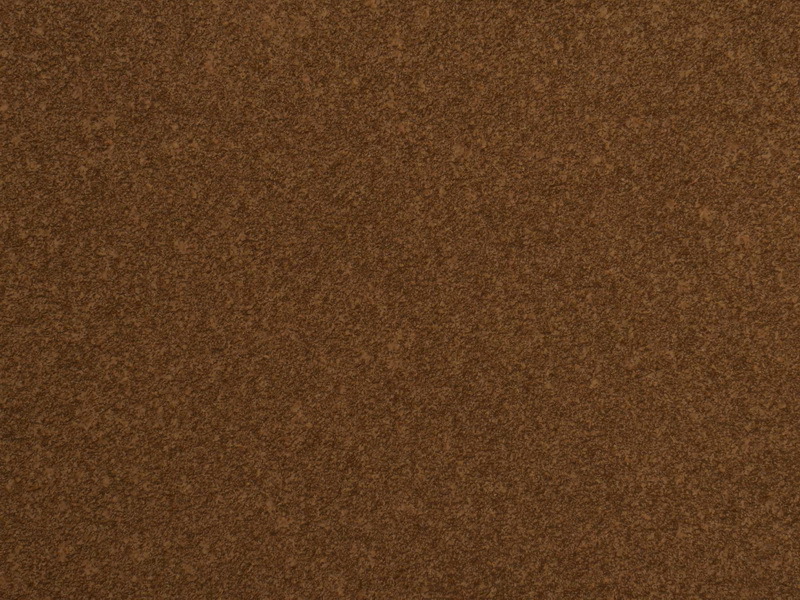 The SEMCO ADA Safety Floor is applicable from as thin as 1/32” to 6”. With the SEMCO ADA Safety Floor a floor slope can be adjusted without extensive demolition or removal of existing flooring. Public access flooring that has drains, grout lines, to control joints, must not have any apertures exceeding 1/4”. 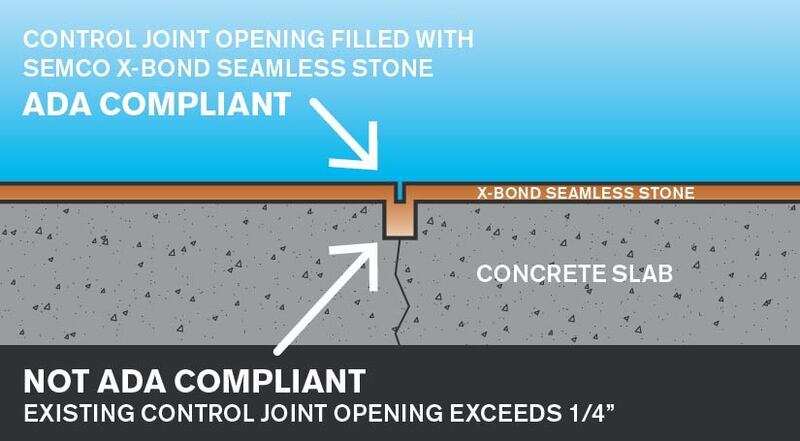 A specific concern is control joints, concrete control joints are specifically designed to control concrete cracking, and it is very common for a control joint to easily exceed an aperture of 1/4”. SEMCO ADA Safety Floor can resolve this situation. Having a strength reaching up to 10,000 PSI, the SEMCO ADA Safety Floor can fill an aperture while still maintaining floor strength and integrity. 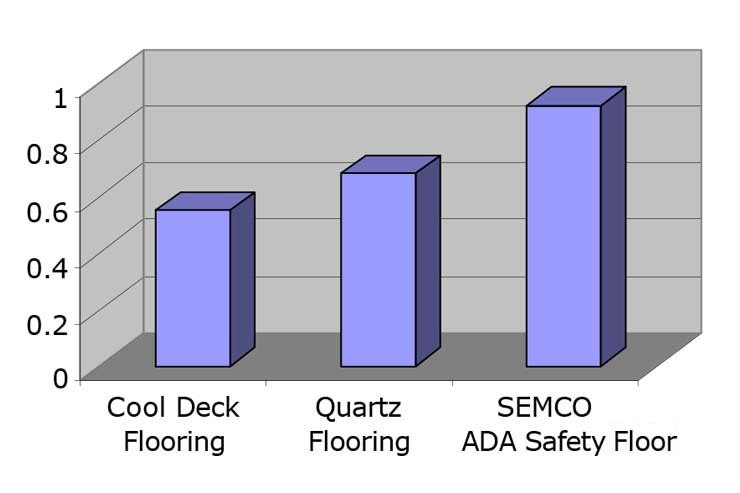 SEMCO ADA Safety Floor has a 5-year manufacturer limited warranty. 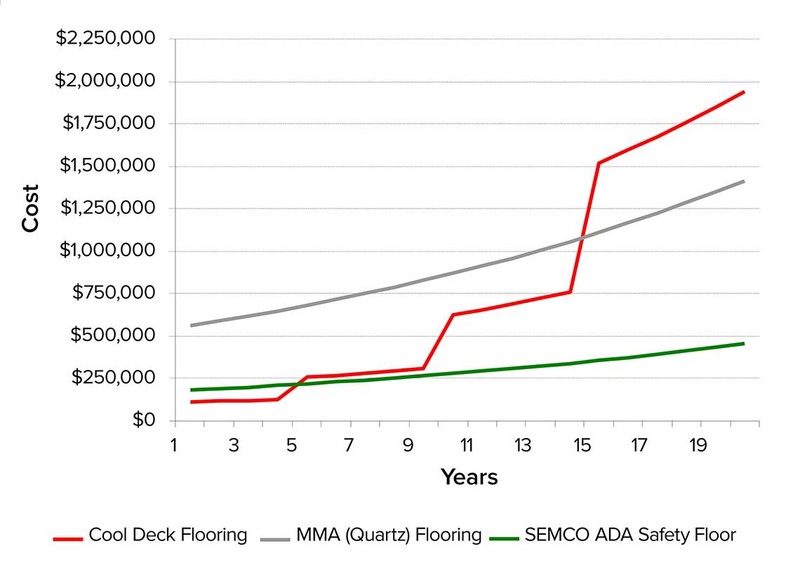 Initial cost of the SEMCO ADA Safety Floor is 68% less expensive than MMA (Quartz) Flooring. The initial cost comparison between SEMCO and cool deck is very comparable, at the 5-year benchmark cool deck must be reinstalled ultimately increasing its long term cost. The SEMCO ADA Safety Floor installation accommodates all location and conditions. SEMCO materials can be easily and safely installed without hassling employees, guests, or customers. This is due to the use of GREEN MATERIALS and the intrinsic properties that allow rapid cure of all installed surfacing. 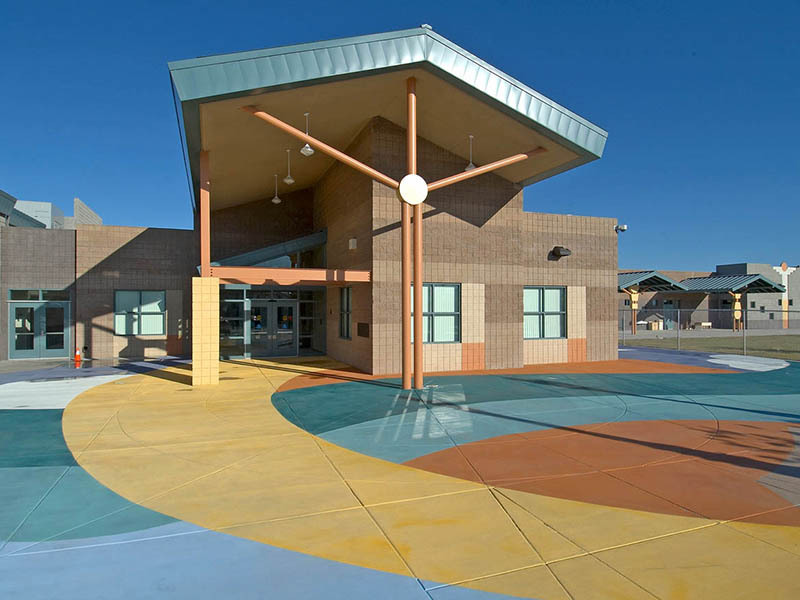 SEMCO materials were used to replace the existing deck for its ease of installation and slip resistance. 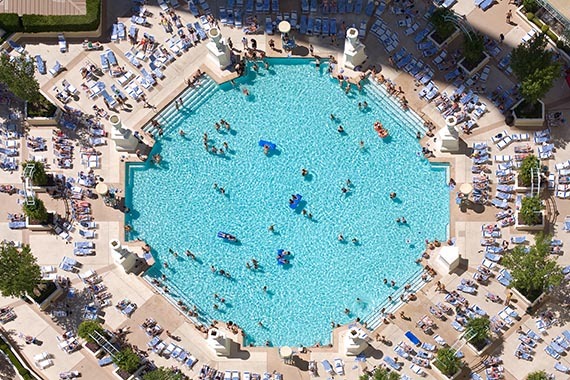 As of 2007 the incidence of slip and falls on the Paris Pool Deck has been reduced significantly. The SEMCO ADA Safety Floor has been shown to reduce slip and fall by up to 90%. 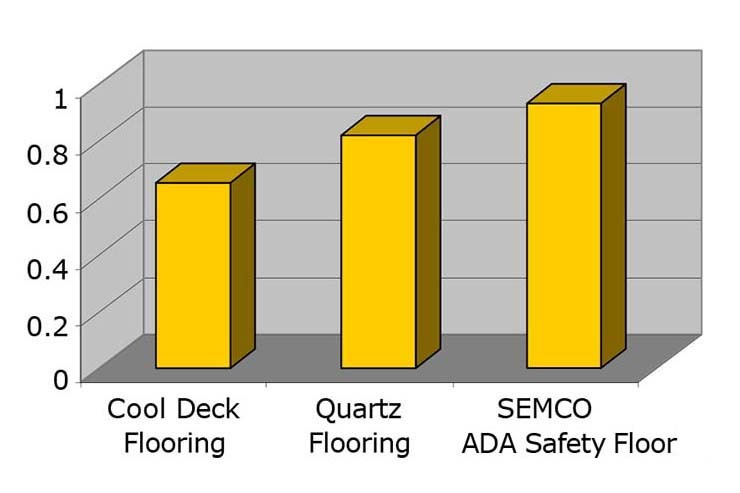 *Data provided by an accumulated average of decks executed with the SEMCO ADA Safety Floor. Agnisit iscitatiste estius, ut aute ratio. Ehendi nemped molores equatem experum, quossima a cuptibus parchil minvellaccab iducide nihillorrum adipici llaccul lupides trumquame verum ea cone iminte inctatur sumquiandia siminis min cuptiorrum exeratem et, que vid qui aritatiae exercientiis cus, ut et rem repudae porem quia sequiae ommolupti ium dolorest vendita nonetur sum et facia demporeium quae veritassiti bero opta dolorum ut occus.